Originally a shallow marsh, the Menomonee River Valley was filled over time with a variety of materials and adapted for industrial use, dramatically affecting the environment, and in some cases contaminating the land and waters, and restricting the river’s flow. The brownfields left behind created substantial challenges for redevelopment of the Valley, including geotechnical issues, construction site erosion control, stormwater management, air emissions, asbestos management, and building demolition. Many have worked hard to restore the Valley as an economically vibrant area, with healthy waterways, abundant wildlife, and recreational greenspace. Restoration efforts have been underway in the Menomonee Valley and along the Hank Aaron State Trail to help return the adjacent areas to a more natural state. 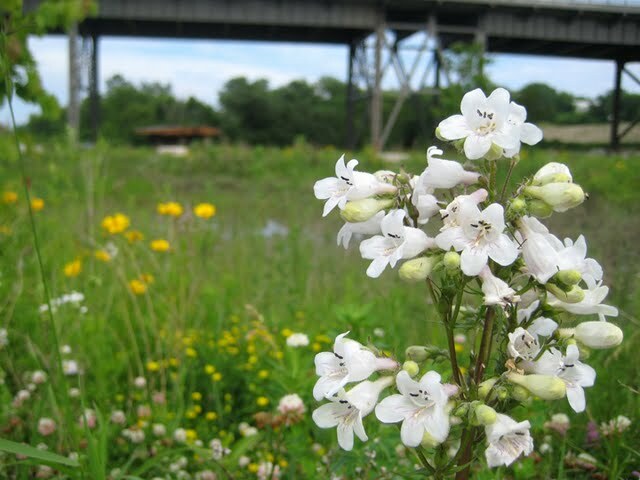 The Department of Natural Resources, Friends of Hank Aaron State Trail volunteers, and corporate partners work to eradicate invasive, non-native species of plants, while restoring native prairie forbs and grasses. This effort helps to minimize stormwater run-off, restore natural habitats for plants and animals, and beautify the area surrounding the Trail. Restoring a prairie to a semblance of its original splendor is a continuing effort in an area that has been disturbed by development for over 150 years. Controlled burnings, mowing, seeding of native plants, and targeted spot removal of invasive species are methods used on the prairie areas along the Trail. 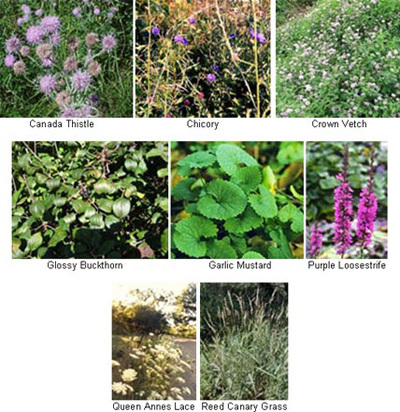 Shown below are some of the targeted species along the Hank Aaron State Trail. You may find several that you recognize, and be pleased to discover that many of the flowers you now see along the Trail are native prairie species. Managing stormwater run-off is one of a major metropolitan area’s most pressing environmental challenges, and Milwaukee is no exception. Wetlands serve as a natural water filter and reservoir to minimize flooding during period of heavy rains. Filling wetlands, as has occurred in the Menomonee Valley over the past 150 years, removes this key natural resource and places strain on sewerage infrastructure to handle run-off during storms. One of the key components of the Menomonee Valley redevelopment is the conversion of the 140-acre former rail yard at the western end of the Valley. Through an innovative public-private partnership, this important parcel has been transformed into a cutting edge business district and community park that demonstrates how new development can coexist with – and actually strengthen – the surrounding ecology and neighborhoods. The area has garnered national attention, including an award from the American Society of Landscape Architects. The park’s River Lawn provides visual and physical access to the river for trail and park users. A large portion of the River Lawn is dedicated to stormwater management, so this area takes on more passive uses such as informal lawn and naturalized areas along with a network of trails. As can be seen in the sketches below, the lawn serves the purpose of a retention pond to handle large influxes of water during heavy storms. This lessens the likelihood and impact of flooding, and relieves the strain on sewerage infrastructure leading to improved water quality. The natural prairie restoration efforts being undertaken along the Hank Aaron State Trail and throughout the Valley further aid in minimizing erosion and stormwater run-off by providing ground cover and a strong root structure. The Hank Aaron State Trail is a key component of the redevelopment of the Menomonee Valley, providing a natural corridor connects the Valley’s greenspaces. The most notable of these is the Menomonee Valley Community Park at the west end of the Valley, which will provide much-needed recreational facilities to serve surrounding high-density neighborhoods, including playfields. Trails to the water edge allow for canoe and kayak set-ins, giving boaters access to a beautiful stretch of the Menomonee River. Turning the former brownfields into greenspaces has created plentiful opportunities for recreation and exercise, improved stormwater management and air quality, and quality habitat for plants and animals.